There are so many ways to enjoy Piroulines. The great thing is, Piroulines can be the last thing you eat at night, to satisfy your sweet tooth after dinner. 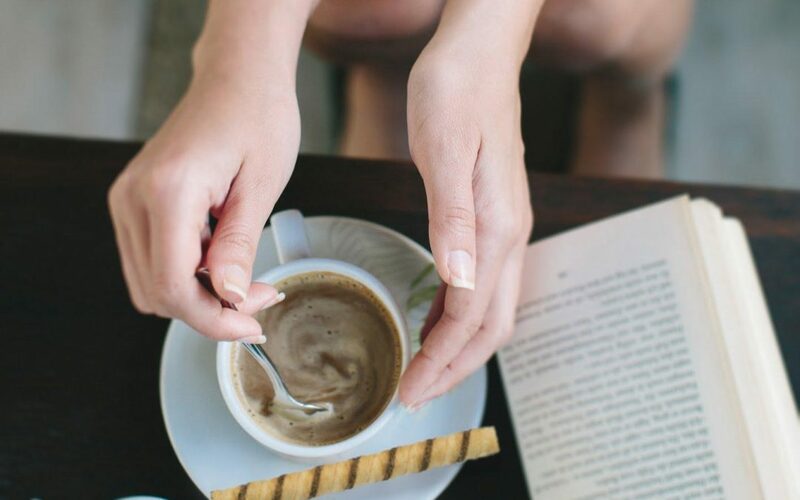 They can also be the first thing you eat in the morning, as you treat yourself to a little relaxation before your grind by pairing Piroulines with coffee and the book. After all, not all mornings have to be chaotic before rush hour traffic, a long workday or rushing the kids out the door to school. No matter how you savor our special swirled dessert, pairing it with coffee is a partnership many enjoy. If you celebrate your coffee flavors like your Piroulines, we’ve put together a tasty tandem to start your day off right and help you with the right Pirouline coffee pairing! Espresso is known for its bold, deep flavor that sends a bolt of caffeine straight through your veins. Our Chocolate Hazelnut Rolled Wafer is the perfect partner to pair with this strong coffee since it provides a stronger taste. Lattes are a blend of espresso and milk and provide a balanced taste of sweetness and rich coffee tones. The Dark Chocolate Rolled Wafer is perfect to pair with your latte – try swirling your Pirouline while it is hot to create a deeper sweet flavor. Cappuccinos are much like a latte, with more milk. Because the coffee flavor is lighter, you will want a lighter dessert to pair it with. Try the limited edition flavor Vanilla Rolled Wafer with your next Cappuccino. Just in case you needed another reason to have strawberries and chocolate – mochas and our Strawberry Pirouline make a great combination! The sweetness of mocha and the crisp flavor of our Strawberry compliment each other nicely. In the fall, there are few things better than a cup of fresh coffee and pumpkin spice everything! Because our Pumpkin Spice Rolled Wafer supplies a rich and prominent flavor, a cup of black coffee goes best! What other combinations of coffee and Pirouline have you tried? Let us know on social media by using #shareaswirl! You can try any of the following stories: TJMaxx, Marshall’s, HomeGoods, Ross Stores, Burlington, At Home, Tuesday Morning, Christmas Tree Shops, Big Lots! Thank you for being a Pirouline fan!